That's what happened off Russia's east coast on December 18 last year. A giant explosion occurred above the Bering Sea when an asteroid some ten metres across detonated with an explosive energy ten times greater than the bomb dropped on Hiroshima. 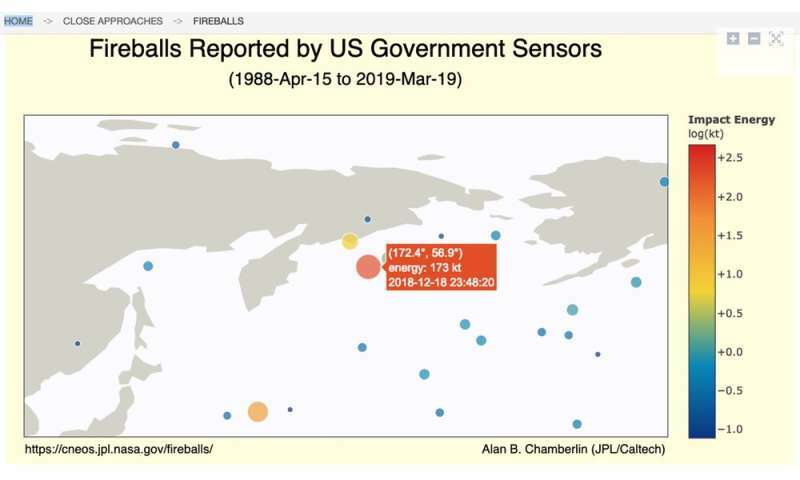 But because it happened in a remote part of the world, it went unremarked for more than three months, until details were unveiled at the 50th Lunar and Planetary Science Conference this week, based on NASA's collection of fireball data. Typically, people argue that Tunguska-sized impacts happen every few hundred years, but that's just based on a sample of one event. The truth is, we don't really know. If we discover a collision is pending in the coming days, we can work out where and when the collision will happen. 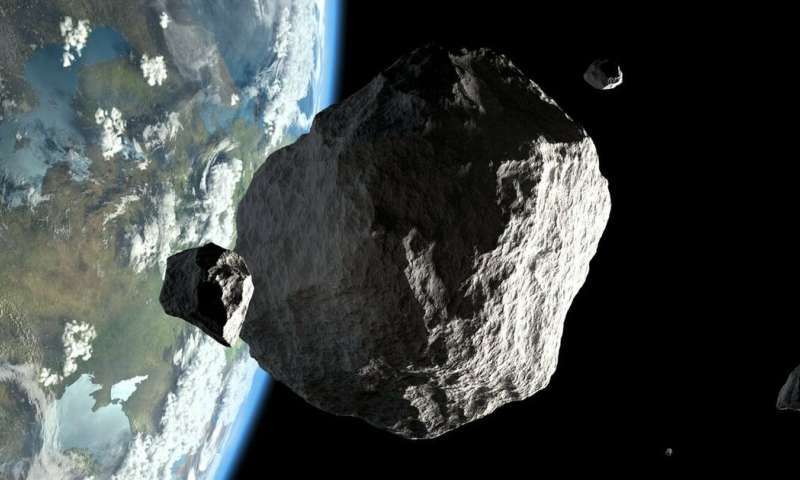 That happened for the first time in 2008 when astronomers discovered the tiny asteroid 2008 TC3, 19 hours before it hit Earth's atmosphere over northern Sudan. Surveys scour the skies, looking for faint star-like points moving against the background stars. 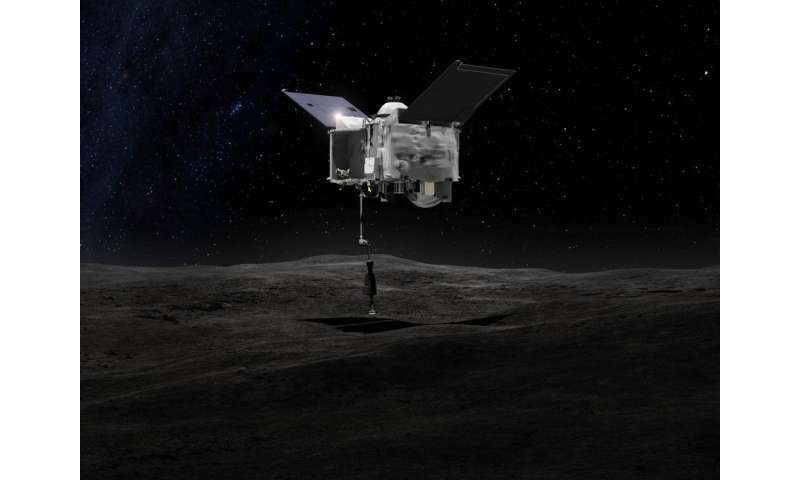 A bigger asteroid will reflect more sunlight, and therefore appear brighter in the sky—at a given distance from Earth. The Chelyabinsk impact is a great example. Moving on its orbit around the Sun, it approached us in the daylight sky—totally hidden in the Sun's glare. A serious problem, that demands a serious answer. Oh, people talk & talk & talk endlessly. Cause nobody wants to pay for the fleet of detector satellites & supporting installations even the most for even a basic system. that assemble oblations of crude repetitions of basic detectors out of the material in the Earth-girdling junkyard & any small rocks floating by with useful metals & volatiles. But, everybody hates sensible ideas such as logistics & efficient conservative technology. The NASCAR bunch would laugh at them. & such a minimalist method offend the comicbook cultists. Plus they fear losing the chance to grasp a profit from screwing the other guy over. Our monkey instincts will be the death of us all.